A wine with such a structure demands meat, just as its tannins make the chosen beef cut show off. The fruity and spicy aromas of the wine match perfectly well with the roasted vegetables, which in turn add a sweet touch thanks to their passage through the oven. 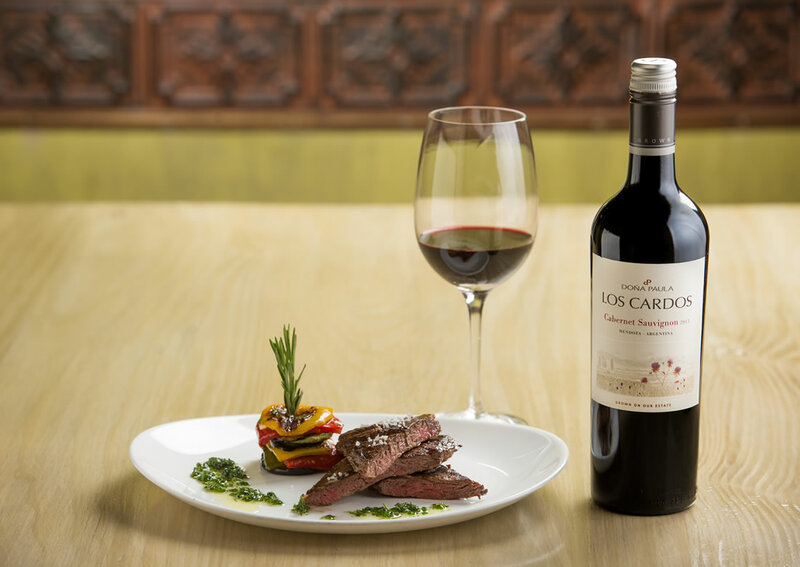 The chimichurri sauce is in charge of complementing the dish and of pairing the wine through its pink pepper note. Skirt steak – 600 g.
Cut the eggplants, the zucchinis and the onions into thin slices. Wash and cut the peppers into rectangles. Place all the vegetables on a baking tray and add olive oil, salt, pepper and a few sprigs of thyme. Cook in the oven at medium heat for 10 minutes. Remove from the oven and form small towers with the different vegetables. Mix the chopped fresh herbs and season them with sea salt. Then add lemon juice, Tabasco sauce and, finally, olive oil. Clean the meat and season it with salt and pepper. Cook the skirt steak on a griddle at high heat for a few minutes on each side, until it is crisp and juicy inside. Serve with the oven-baked vegetables and garnish with the fresh herb chimichurri.